The subject of this painting was inspired by Lord Byron's dramatic poem of 1821 about the life of an ancient Assyrian king named Sardanapalus. Finding his palace besieged by enemies, Sardanapalus decides to kill himself, but first orders his officers to destroy all his favorite possessions in his presence—his wives, pages, and even his horses and dogs. This painting is a replica of a much larger work, now in the Musée du Louvre, Paris, that Delacroix first exhibited in the Salon of 1827–28, where it received harsh criticism. Delacroix may have painted this Museum's version for himself before selling the larger work in 1846. 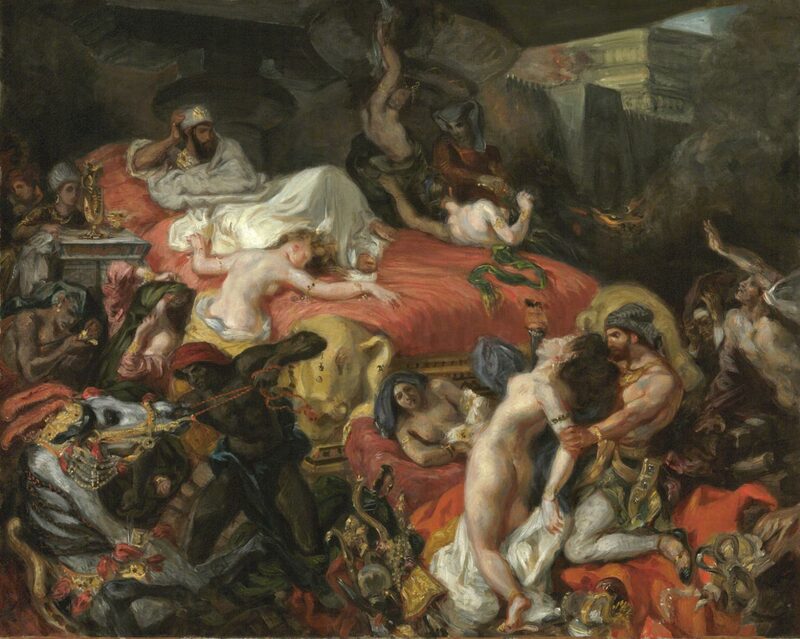 When Eugène Delacroix showed his huge painting inspired by Lord Byron's play Sardanapalus in the Paris Salon of 1827-28, he changed the history of art completely. With its appearance the splendor and opulence of Baroque painting returned full force, putting to question all the restraint and clarity that had been revered as classical truths. It marked the coming of age of Romanticism and launched the thirty-year-old Parisian's meteoric career. Yet for all its notoriety, Delacroix's painting, now in the Louvre in Paris, was not sold until 1846, when, it is thought, the Museum's quickly worked picture was done as a reprise (in much reduced proportions). The artist's obvious pleasure in mixing color and relaying drama remains undiminished in the copy, as Delacroix records the last moments of the Assyrian king. As his palace is besieged, Sardanapalus reclines on a sumptuous bed atop an immense pyre that will soon be set aflame, and orders the slaughter of all his women, his attendants, and even his horses and dogs, so that no objects of his pleasure would outlive him. Joseph J. Rishel, from Philadelphia Museum of Art: Handbook of the Collections (1995), p. 190. Bequest from the artist to Legrand, 1863 ; Prosper Crabbe (1827-1889), Brussels, by 1873 ; A. Bellino, by 1885-1892 ; his sale, Galerie Georges Petit, Paris, May 20, 1892, no. 11 (illus.). With Wildenstein & Co., New York, by 1930 . With Paul Rosenberg & Co., New York and Paris, by April 1934 ; sold to Henry P. McIlhenny, 1935; bequest to PMA, 1986. 1. According to Robaut (see note 3), Legrand was an attorney and the executor of Delacroix's will, and the painting passed upon his death to Mr. Crabbe and then to Mr. Bellino. 2. Sénateur Prosper Crabbe (1827-1889) was a stockbroker and Brussels collector of eighteenth- and nineteenth-century French art. A notice in The Academy (London), vol. IV, no. 74, 1873, p. 230, states that "a reduced replica of the great picture of Sardanapalus by Delacroix now exhibiting at the Society of French Artists in Bond-street, was bought by M. Prosper Crabbe at the Wilson sale for 70,000 francs." However the only Delacroix painting in the Daniel Wilson sale of 1873 was the original 1827 version now in the Louvre. 3. Preceding provenance per Robaut, L'oeuvre complet de Eugène Delacroix (Paris, 1885), no. 791, and the 1885 exhibition catalogue, "Exposition Eugène Delacroix," École Nationale des Beaux-Arts, no. 8. 4. Wildenstein lent the painting to the exhibition in Paris, Palais du Louvre, "Exposition Eugène Delacroix," June-September 1930, no. 112 (see also exhibition loan label on reverse of painting). 5. Copies of correspondence between Rosenberg and McIlhenny in curatorial file.